I heard about Algorithmia when their Colorize It demo was featured on Product Hunt. I’m an aspiring developer, and immediately fell in love with the way they made machine intelligence accessible to me. I had been building chatbots using the python-telegram-bot wrapper for the Telegram Bot API, but then a light went off in my head: a Telegram chatbot that you can use to summarize your text. How cool would that be? 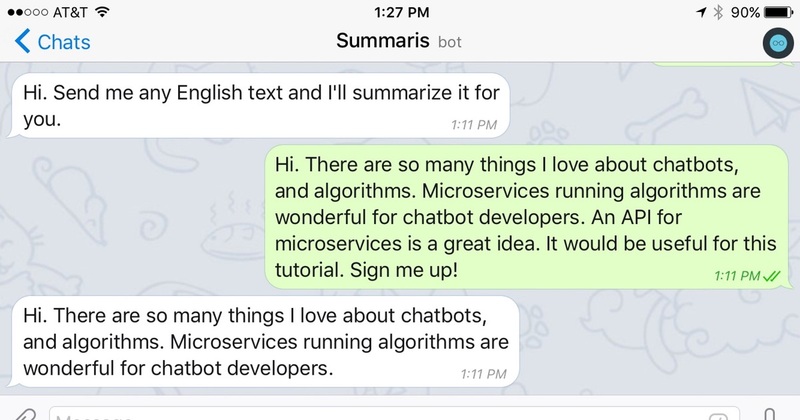 In this tutorial, I’ll walk you through everything you need to create a chatbot with Telegram and Algorithmia that summarizes the text you send it. Here’s a live example of the chatbot we’ll be building on Telegram. Just talk to it @summaris_bot. You’ll need a free Algorithmia account for this tutorial. Use the promo code “summarizer” to get an additional 5,000 credits when you sign up. You’ll also need the latest version of python-telegram-bot, which is version 5.0.0 at the time of writing. Let’s install that too. If you know you don’t want to use python-telegram-bot, you’re free to use something else, but you have to adapt the code yourself. Start by opening a new Python file in your favorite (plain) text editor. I use Sublime Text. I’ll name my file bot.py (how original!). This will make all dependencies available to use. This will enable logging, so that we’ll be able to debug the bot if needed. It might not seem like much, but logging can help uncover tricky bugs. Now it starts to get interesting. You need an API key to talk to the Telegram Bot API. How do you get one? Talk to @BotFather on Telegram, and if you need help, see how to use BotFather. # This is the token for the Telegram Bot API. So whenever someone starts chatting with our bot, it will say hi! To fully make this work, enable the /start command. If the message contains only text, then we also call the summarize_handler, followed by our dispatcher. We’ll finish this bot up by adding our summarizer_handler and add_handler lines, which will summarize our messages, and send them to the chatbot. Our Telegram chatbot that summarizes text is ready to go. We’re hosting it on Digital Ocean. Get the complete code sample on GitHub, where you can create a chatbot for yourself. Remember to use the promo code “summarizer” to get an additional 5,000 credits when you sign up for Algorithmia. We could have added additional intelligence to our chatbot by using other microservices to analyze the text for sentiment, automatically generated topic tags, or checked our text for profanity. Barend is a 16-year-old Python enthusiast. You can follow him on Twitter, where he tweets about new websites and apps, series and articles worth reading.